In 2001, Matt Savage was directing poker tournaments at the Lucky Chances Casino and playing local tournaments in the San Francisco Bay Area. He found that tournament rules were different from property to property and for different events at the same property. In an attempt to standardize tournament rules he traveled to Las Vegas to meet with the Tournament Directors of the World Series of Poker. Matt’s idea was met with resistance and the general idea that it would be too difficult to get all major tournaments conducted under a common set of rules. Doors began to open when Savage met with business partners Linda Johnson and Jan Fisher who were hosting the WPIC (World Poker Industry Conference). The WPIC was an ideal venue because many tournament directors and cardroom managers were in attendance. The trio reached out to widely respected tournament director David Lamb for assistance and the Poker Tournament Directors Association was born. Twenty-four people attended the first Poker TDA Summit. Since then the Association has grown to more than 2,500 members in 63 countries. 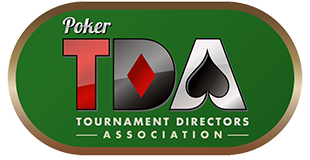 Poker TDA Rules are now used in most major tournaments around the world. In 2017, Dave, Jan, and Linda stepped down from daily management of the Association but remain active as Emeritus Directors. Joining Matt on the Board of Directors are industry veterans Jack Effel, Tab Duchateau, Neil Johnson, Johnny Grooms, Lloyd Fontillas, and Mike Bishop. To contact the Board, please e-mail: AsktheBoard@PokerTDA.com.